We have developed an advanced system for 3D scene reconstruction from multiple image views, such as those obtain from full-moving videos (FMV) onboard unmanned vehicles (UAVs). If a scene of interest is seen from several viewing cameras (with different calibration parameters and physical characteristics) positioned around the target, even distinct illumination degrees, occlusion, scale, image resolution, share effect or motion, we have the only commercially available computational package capable of getting a high-definition 3D scene reconstruction, as part of our Raphael Ground Control Station (GCS) system. The results, however, also indicate that further work on texture (given by distinct illumination conditions, imaging systems and mission tracks) is needed, given the apparent discontinuity on some parts of the final textured scene. However, this aspect does not affect the overall 3D reconstruction approach herein proposed. The system is able to reconstruct 3D targets with an accuracy of 1% relative to a characteristic length such as building height, where said targets are reconstructed from a series of FMV sequences. 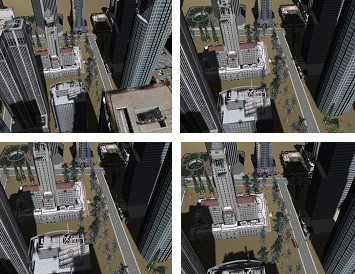 This 3D scene reconstruction work for multiple image views of a target of interest, where the position of each viewing image is only roughly known, is ideal when digital images (including photographs) are available, for example because the phenomenon is unique or of difficult access such as an asteroid, perhaps videos from a youtube website, or a combination of aerial videos taken at different times from varying positions with a range of imaging systems and/or ground images of a target of interest. When a sophisticated/expensive/heavy sensor such as a Light Detection And Ranging technology (LIDAR) cannot be readily accessed due to cost, availability or maximum payload constraints of a platform such as a tactical UAV, even thus, we can get an accurate 3D scene reconstruction using images. This approach will be widely useful in coming years. Initially, our 3D scene reconstruction algorithm assumes multiple image views in the form of several digitally-captured 2D images of a scene or target taken from different angles and under distinct weather conditions. Theses images can be coded in .bmp, .png, .jpg, .gif, .mpeg, .avi, or any other digital format. Our software automatically computes information about location and orientation of the cameras only from the images themselves using computer vision methods, though providing rough GPS information certainly speeds up the process. The algorithm developed works by breaking down the problem into several stages. These will be covered as follows: in section 2 camera model and calibration is presented. Detected features points are described on section 3, and section 4 presents the algorithm about matching point features between pairs of images. Section 5 refers to an iterative Structure from Motion (SfM) procedure to recover the camera parameters. Section 6 presents two methods about stereo-matching of calibrated images. The Poisson reconstruction with oriented 3D reconstructed points set is presented in Section 7. The final texture 3D scene is described in Section 8. Finally, Section 9 shows an optional and complementary module that is useful to align multiple mission tracks under distinct weather condition and illumination conditions in order to get a more detailed 3D scene reconstruction model. Figure 1 shows images taken by the synthetic vision module of our ground control station Raphael GCS (Gutiérrez-Resendiz and Funes-Gallanzi, 2009). Figure 1. Four images taken from the synthetic vision toolkit of Raphael GCS are shown. As a first step, we consider a camera as an electronic device that records an image digitally. The pinhole camera model is widely used as the real camera projection. This model is based on the principle of collinearity, where each point in the object space is projected by a straight line through the projection center into the image plane. It is a useful model that enables simple mathematical formulation for the relationship between object and image coordinates. However, it is not valid when high accuracy is required and therefore, a more comprehensive camera model must be used. The model contains parameters divided into extrinsic and intrinsic parameters. Extrinsic parameters refer to camera pose and intrinsic parameters refer to image plane properties. The origin of the camera coordinate system is in the projection center at the location (x0, y0, z0) with respect to the object coordinate system, and the z-axis of the camera frame is perpendicular to the image plane. The rotation is represented using Euler angles ω, φ, and κ that define a sequence of three elementary rotations around x, y, z-axis respectively. Rotations are performed clockwise, first around the x-axis, then the y-axis which is already once rotated, and finally around the z-axis that is twice rotated during the previous stages. where k1 and k2 are coefficients for radial distortion, and ri = √(ũi² + ṽi²). Typically, one or two coefficients are enough to compensate for the distortion. Curvature centers of surface lenses of lens surface are not always strictly collinear. This introduces another common distortion type, de-centering distortion that has both a radial and tangential component. where p1 and p2 are coefficients for tangential distortion. In this model the set of intrinsic parameters (f, su, u0, v0 ) is augmented with the distortion coefficients k1, k2, p1 and p2. These parameters are also known as physical camera parameters, since they have a certain physical meaning. Generally, the objective of the explicit camera calibration procedure is to determine optimal values for these parameters based on image observations of a known 3D target. In the case of self-calibration, the 3D coordinates of the target points are also included in the set of unknown parameters. Since we have the pinhole camera model for the captured images and we have calibrated each camera, we created an image list with information about image sizes and camera focal length. Since images had been captured under different conditions; this last data could not always exist, however our system may calculate an initial estimation for it, or posses a database with a family of imaging systems characterized as used in any particular theater of operations. Principal point: 321.9588, 237.3126 pixel. Figure 2. The radial and tangential effects are shown. The effect has been exaggerated 10 times. Figure 3. A window of the camera calibration module is showed. Scale-space extreme detection: The first stage of computation searches over all scales and image locations. It is implemented efficiently by using a difference-of-Gaussian function to identify interest points that are invariant to scale and orientation. Keypoint location: At each candidate location, a detailed model is fitted to determine location and scale. Keypoints are selected based on measures of their stability. Orientation assignment: One or more orientations are assigned to each keypoint location based on local image gradient directions. All future operations are performed on image data that have been transformed relatively to the assigned orientation, scale, and location for each feature, thereby providing invariance to these transformations. Keypoint descriptor: The local image gradients are measured at the selected scale in the region around each keypoint. These are transformed into a representation that allows for significant levels of local shape distortion and change in illumination. Consider a 16x16 patch centered on the keypoint. Decompose this patch into 4x4 pixel tiles. For each such tile, we compute a histogram of its pixels gradient orientations with 8 bins, each covering 45 degrees. Actually, we specify these gradient orientations “relative” to the keypoint's dominant orientation. We weigh the contribution to the bin by the gradient magnitude. 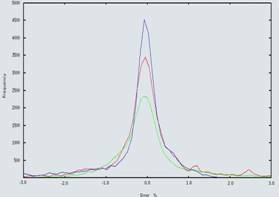 We use a circular Gaussian falloff from the keypoint center (about 8 pixels, half the descriptor window). This gives 16 tiles x 8 histogram bins/tile = a 128-dimensional vector representing our a SIFT feature descriptor. Normalize this to unit length. For better illumination invariance a threshold value in this normalized vector to be no larger than 0.2 and then renormalize. This vector normalized is invariant to location, scale, rotation, share and changes in illumination. The figures below shows a typical output of a SIFT detection process. Each image contains thousands of SIFT features. Keypoints are shown as vectors in cyan with magnitude and direction only. Figure 4. Figures show keypoints. Left) The 798 x 510 pixel image has 4467 keypoints. Rigth) The 798 x 510 pixel imagehas 3824 keypoints. The keypoints are displayed as vectors indicating scale, orientation and locations. We take Euclidian distance in the space of 128-dimensional vectors. We use kd-trees for efficient near neighbor search. We compare the distance to best matching SIFT feature in the database, and the distance to the 2nd-best matching feature. If the ratio of closest distance to 2nd closest distance greater than 0.8 then reject as a false match. The figure below shows a typical example of SIFT matching between two arbitrary chosen images. A cyan line marks the correspondence between two keypoints. However, we have included epipolar geometry constraints in order to do a best matching between keypoints as describe below. Figure 5. SIFT matching between image 1 and image 2. The cyan line marks the same point seen on different frames. During each RANSAC iteration, we compute a candidate fundamental matrix F using the eight-point algorithm (Hartley and Zisserman 2004), followed by a non-linear refinement. The epipolar constraint is applied intensively around the SIFT matching to ensure better feature matches. We look for a set of geometrically consistent matches between each image pair in an incremental scheme to reconstruct an initial sparse 3D point-cloud and camera pose. Finally, we remove matches that are outliers to the epipolar geometry constraint. 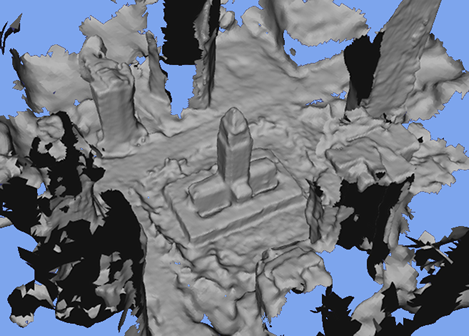 In addition, we recover an initial set of camera parameters and 3D scene reconstructed point-cloud. In order to get refinement for new camera poses and 3D scene point-cloud, we take the back-projection error as the cost function to minimize it. This is a much more computationally-intensive approach than previously reported but it is robust and able to cope with real-life images. Once the last frame is added, a regularization method for final camera poses is calculated by a generic Bundle Adjustment method, based on the sparse Levenberg-Marquardt algorithm given by Lourakis and Argyros (2004). The Bundle Adjustment is calculated till back-projection errors convergence. The initial 2D-to-3D correspondence is refined by the Bundle Adjustment scheme, and it is used to compute the final camera pose. 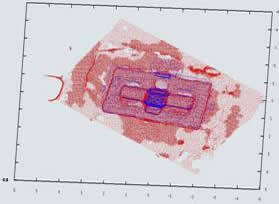 The 3D point-cloud scene reconstruction is carried out, using all 2D camera views and 3D camera-specific information. A typical Bundle Adjustment output, is as shown in figure 6. So far we have constructed a sparse 3D point-cloud of the viewed scene and to simultaneously recover camera poses, as shown in figure 6. In order to get a dense matching between multiple view images, we have combined two methods for this purpose. In order to get dense 3D oriented points, we combine two multi-view stereo matching methods: Iteratively-grown surface from matched points (Goesele et. al., 2007) and Patch-based Multi-view Stereo (Furukawa and Ponde 2007, 2009). After, the dense matching is done, we solve for the iso-surface solution in a Poisson surface reconstruction algorithm as given by Kazhdan et. al. (2006). Iteratively grows surface from matched points (Goesele et. al., 2007): This stereo matching technique takes as input sparse 3D points reconstructed from bundle adjustment method and iteratively grows surfaces from these points. The main algorithm looks at both depth and normal vector, starting from an initial SIFT matched points or copied from previously computed neighbors. In order to find optimal surfaces around SIFT matches, we apply a two-level view selection camera: i) at the image level, global view selection identifies for each reference view a set of good neighborhood images to use for stereo matching. ii) at the pixel level, local view selection determines a subset of these images that yields a stable stereo match. The optimization stage for surface normals is within a photometry consistency calculation what significantly improves the matching results. We include reflectance coefficients between pair images in order to model changes in illumination. After we have run this stage, we have oriented points around SIFT matched points within a list of associated cameras, each potentially with different characteristics. Matching: Features found by Harris and Difference-of-Gaussians operators are matched across multiple images, yielding a sparse set of oriented patches associated with salient image regions. Given these initial matches, the following two steps are repeated 3 times. Expansion: The technique is used to spread the initial matches to nearby pixels and obtain a dense set of oriented patches. Filtering: Visibility constraints are used to eliminate incorrect matches lying either in front or behind the observed surface. The two methods yield a table of 3D-oriented points with a list of associated cameras. If we merged the two previous algorithms, we have a better representation of the 3D scene reconstruction. Now, we use a Poisson reconstruction algorithm in order to get the final 3D mesh associated with the final reconstructed model. We follow the work done by Kazhdan et. al. (2006). We assume the surface reconstruction from oriented points can be cast as a spatial Poisson problem. This Poisson formulation considers all the points at once, without resorting to heuristic spatial partitioning or blending, and is therefore highly resilient to data noise. Unlike radial basis function schemes, the Poisson approach allows a hierarchy of locally supported basis functions, and therefore the solution reduces to a well-conditioned sparse linear system. Poisson surface reconstructions generate a mesh from a set of surface samples. After Poisson reconstruction is performed for the previous stereo matching step, we get a refined surface. Figure 7 shows the surface obtained from the 3D-oriented points given by the merged stereo matches techniques above. Figure 7. Poisson surface reconstruction of the previous stereo-matched mesh. The texture is taken from the camera views and combined to form a multi-texture surface. In order to take into account the appropriate texture of the 3D reconstructed model, we follow two steps: i) Each reconstructed 3D point has a list of associated cameras, given by the SIFT matching process and the bundle adjustment process and ii) each 3D reconstructed point has a list of visibility after the stereo matching process is done. Thus, we have at least two criteria for the visibility for a given 3D reconstructed point. Since the stereo matching process has an implicit high degree of photometric consistency, we combine visibility information to take the camera that has the maximum, color cross-correlation within the cameras list in a small oriented patch around each 3D reconstructed point. We check RGB color continuity around each orientated patch in order to assign texture on it. The figures below show the textured 3D reconstructed model directly compared to the original CAD model. In addition, the Figure 9 shows the 3D scene reconstruction and it displays some of the camera poses. Figure 8. 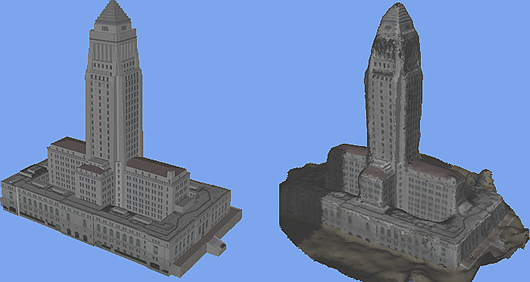 Original CAD building (a) compared to its 3D reconstruction from FMV (b). Figure 9. 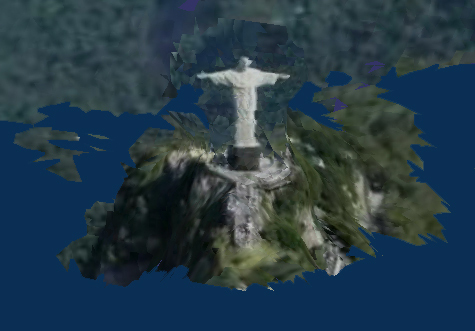 A practical application taken from youtube videos of the Corcovado in Rio de Janeiro, where we can see a sample view(a) and a video of the reconstructed terrain (b). 8. Alignment between independent mission tracks. We also take into account that when we have independent mission tracks under distinct operational conditions, we have additional information to get a more detailed 3D reconstruction, since the new images can be seen from different points of view and different illumination conditions, even using distinct imaging devices. This fact allows us to write down an extra module that aligns independent 3D reconstructions given by distinct mission tracks and it gets better detailed 3D reconstruction with appropriate texture with reduced illumination effects. In order to overlap two 3D oriented point sets, we have used a modified version of the Iterative Closest Point (ICP) algorithm developed by Besl and McKay (1992), Chen and Medioni (1992) and Zhang (1994). A classical ICP is based on the search for pairs of nearest points in two data sets and estimates the rigid body transformation that aligns them. The rigid body transformation is then applied to the points of one set and the procedure is iterated until convergence is achieved. This point-to-point scheme has low convergence. Thus, we have used a modified version of the ICP, the point-to-tangent plane approach originally proposed by Potmesil(1983). The search for pairs of nearest points in two data sets, is done using a kd-trees structure. 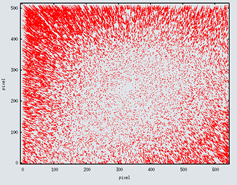 Thus, the Approximate Nearest Neighbors package of Arya, et. al. (1998) is used extensively is this process. On the other hand, the rigid body transformation is given by a translation vector T(x, y, z) and a matrix of rotation R(ω, φ, κ). In order to find the correct rigid body transformation, we have used a Levenberg-Marquardt algorithm as the least square method to solve for the translation vector and rotation matrix. Furthermore, we have included in the least square problem information about normal vectors over each matched pair point. Finally, we get an enlarged list of 3D orientated points with additional information about mixed cameras. This new list of 3D orientated points is filtered out using the Poisson reconstruction process to get a new 3D surface reconstructed model with additional detail given by the combination of multiple and independent mission tracks. Since we have more 3D oriented points with associated camera-lists, we can get a better texture 3D surface model. Of course, this extra images could include images taken from the ground, thus being complementary to those taken from satellites, LIDAR and unmanned vehicles in more than one mission and at different times in order to derive a high-quality 3D reconstruction of any target of interest. 9. Comparison between CAD model and 3D reconstructed scene. We have tested this algorithm on a number of real-life objects but here we show a study of a building of known dimensions in order to quantitatively estimate the algorithm’s accuracy. We have quantified our 3D reconstruction process through a typical 3D scene reconstruction with a well-known CAD model. This is done within the synthetic vision module of Raphael GCS in order to compare the 3D surface reconstruction and the original 3D mesh model point set. We have taken the template and fixed and fitted the 3D reconstructed mesh using a modified version of the ICP algorithm as above. We search in an iterative process for a rigid body transformation that includes normal vector information between this two point sets, and we get the final overlapping mesh between template and 3D reconstructed model. In Figure 10 we show the overlap between the 3D reconstructed model (red dots) and the its well-known CAD model (blue dots). We read in the CAD model from an .OBJ file. As we can see the agreement is excellent. Thus, we calculated a histogram of error associated over each axis. Figure 11 shows a histogram of the ratio between the shortest distance between both model and 3D reconstruction divide by a characteristic scale, in this case the building height. The average standard deviation about the three axes is around 1.0%. model mesh (blue dots). (green line). Standard deviation = 1.0%. We have produced an efficient software system capable of recovering 3D scene information from any combination of full-moving video and still imagery, even when taken under varying illumination conditions and by a range of imaging systems. It is a fundamental need to attention to the camera modeling, its effects and correction coefficients in order to obtain accurate 3D reconstructions. The illumination, scale and rotation effects is overcome by including them into a database by the SIFT methods on the correspondence between multiple view images. Computer vision algorithms are used to reconstructed camera trajectory and pose. We have combined a stereo matching algorithm to get 3D oriented point sets and then, we applied a Poisson reconstruction algorithm to get a refined 3D mesh. Additionally, we have designed a module that aligns two o more 3D reconstructed meshes given by distinct mission tracks. We verified the system by designing a module that compares CAD models with their 3D reconstructed estimates, and found the system to yield errors of the order of 1%. Arya S., Mount D. M., Netanyahu N. S., Silverman R., Wu A. Y. 1998. An optimal algorithm for approximate nearest neighbor searching fixed dimensions. J. of the ACM 45, 6, 891–923. Besl P. J., and McKay N. D., 1992. A method for registration of 3D shapes. IEEE PAMI, 14(2), 239-256. Chen Y., and Medioni G., 1992. Object modelling by registration of multiple range images. IVC, 10(3), 145-155. Fischler M., Bolles R. 1987. Random sample consensus: a paradigm for model fitting with applications to image analysis and automated cartography. Readings in computer vision: issues, problems, principles, and paradigms, 726–740. Furukawa, Y., Ponce, J. 2007. Accurate, Dense, and Robust Multi-View Stereopsis. Computer Vision and Pattern Recognition, 2007. CVPR 07. 1-8. Furukawa, Y., Ponce, J. 2009. Accurate Camera Calibration from Multi-View Stereo and Bundle Adjustment Source. International Journal of Computer Vision 84, 257-268. Goesele, M. Snavely, N. Curless, B. Hoppe, H. Seitz, S.M. 2007. Multi-View Stereo for Community Photo Collections. Computer Vision, 2007. ICCV 2007, 1-8. Gutiérrez-Resendiz F. and Funes-Gallanzi M. 2009. Raphael Ground Control System. In preparation. Hartley R. I., Zisserman A. 2004. Multiple View Geometry. Cambridge University Press, Cambridge, UK. Heikkila J., and Silvén O., 1997. 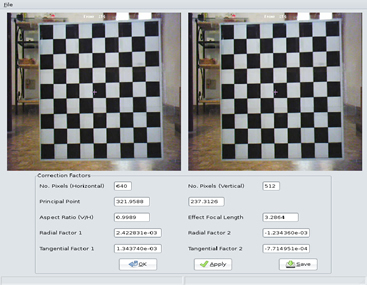 A four-step camera calibration procedure with implicit image correction. Infotech Oulu and Department of Electrical Engineering. University of Oulu. Finland. Kazhdan M., Bolitho M., Hoppe H., 2006. Poisson Surface Reconstruction. Eurographics symposium on Geometry processing 2006. 61-70. Lourakis M. I. A., Argyros A. A., 2004. The design and implementation of a generic sparse bundle adjustment software package based on the Levenberg-Marquardt algorithm. Institute of Computer Science - FORTH. 340. Lowe D. 2004. Distinctive image features from scale-invariant keypoints. Int. J. of Computer Vision 60, 2, 91–110. Potmesil M., 1983. Generating models of solid objects by matching 3D surface segments. International Joint Conference on Artificial Intelligence. Karlsruhe, 1098-1093. Zhang Z., 1994. Iterative point matching for registration of free-from curves and surfaces. Int. Journal of Computer Vision, 13(2), 119-152.